We served 140 guests, but prepared 160 plates in preparation of accidents or spills. I'm pleased to say there were no accidents or spills. The serving went quickly and smoothly by volunteers. All our food items were provided and prepared by volunteers. As I planned the menu, my goal was to select tasty, attractive, easy-to-make recipes. I taste-tested every food item. If the food passed my approval, GJ, AJ and my friends Patty and Mary taste-tested and approved the foods. There were several I made that did not pass my test. Patty printed the recipes in a booklet, along with tea quotes and we made them available to our guests for a $2 donation to the Berea Health Ministry. Watch for a giveaway to be announced soon. I will be giving several items including one of our recipe booklets. Everything looks and sounds wonderful! I would LOVE to have a recipe booklet too! (for a donation of course! )You did a beautiful job! I felt 'puny' yesterday so I crawled into bed with a large mug of hot tea.... could not help but think of you, Linda. Tea and friends, that combo can not be beaten. Hi Linda! 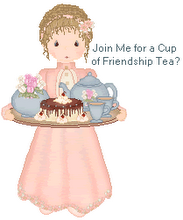 I've been enjoying the pics and postings from your recent tea. Splendid job! I too would be willing to pay for a copy of the recipe booklet. Please let me know if you make it available. Wow! I bet it was great fun and work. Great menu! Everything looks yummy! Now that is a tea I would enjoy sitting and enjoying. Whew! What an event! I helped some friends put on a tea for 100 people this last spring, but we spread it over 2 days ... (it was held in a private home that couldn't hold more than 40 at a time, plus the 10 of us who served and ran the thing) What a lot of work, but it looks great. I can see that the ladies who attended had a wonderful time! What a great menu and the food looked wonderful plated up. You certainly did a superb job.